This bridge is on the site of an earlier stone bridge which carried the K&A towing path across the entrance to the S.C.C. The old stone entrance bridge looking towards Dundas Basin. 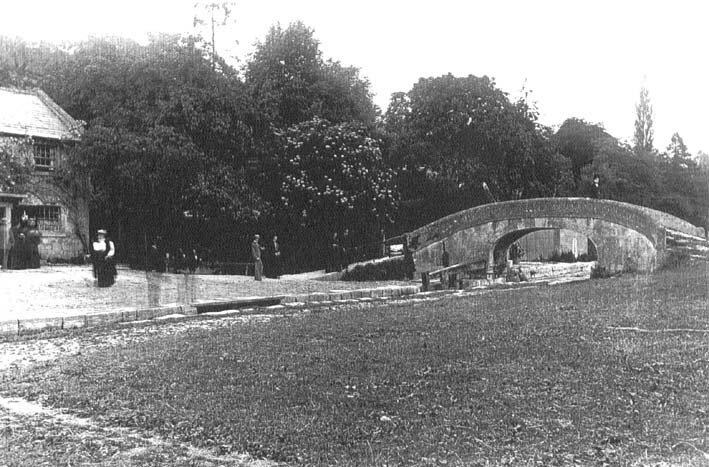 Early in the 20th Century the canal became derelict and the bridge was demolished. In 1985, when the entrance lock was being excavated, some of the stonework from the bridge was discovered at the bottom of the lock, it was salvaged and now forms part of the cottage garden wall on the right of the entrance lock. The aluminium rocker bridge was an experimental design by British Alcan to test the corroding effects of the environment on certain alloys; it was originally installed on the Oxford canal near Banbury. With alteration to the road system in the 1980s it became redundant. One of the restorers of this stretch of the S.C.C., Tim Wheeldon, was working as a helicopter pilot at the time; he spotted the redundant bridge from the air and arranged to have it moved to its present position.